Hi friends! 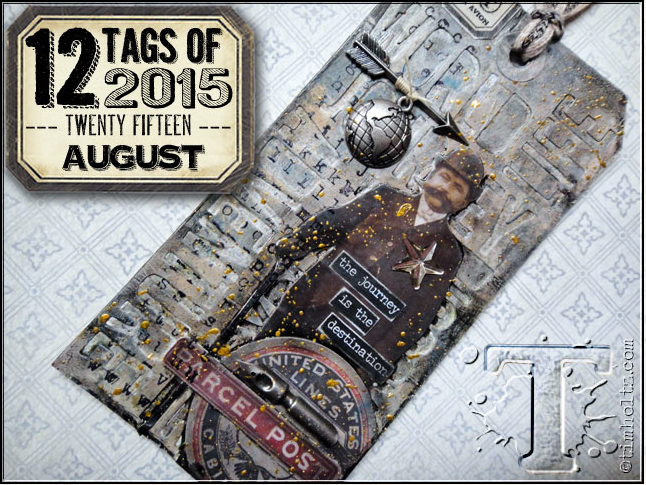 Today I'm sharing my tag for August 12 Tags 2015! I can't remember the last time I created one of Tim's 12 tags or something for just the sake of making something. I need to do this more often! I had a great time, I even stayed up until midnight and that's way past my bed time. The tag is filled with great techniques! Love the background technique, I think that's my favorite part. 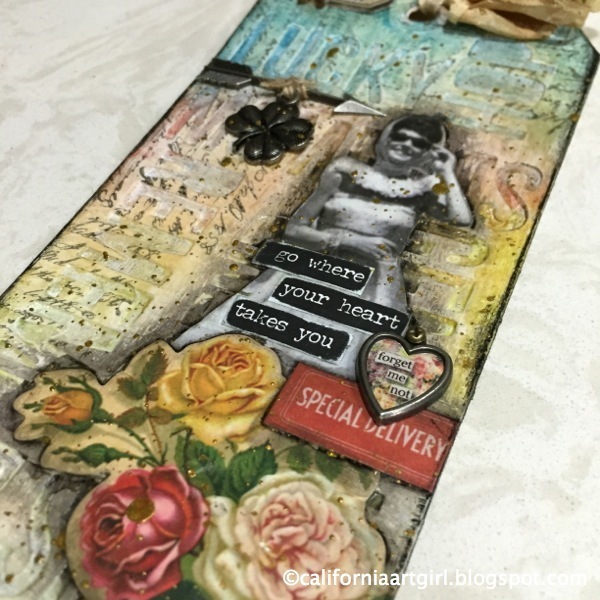 "go where your heart takes you"
Check out Tim's blog for the full tutorial! Have some FUN and try some new techniques! I hope you will join in and don't forget to upload YOUR tag on Tim's blog...there could be prizes involved! Upcoming Classes at Scrapbook Island's Creative Escape! Hello there! 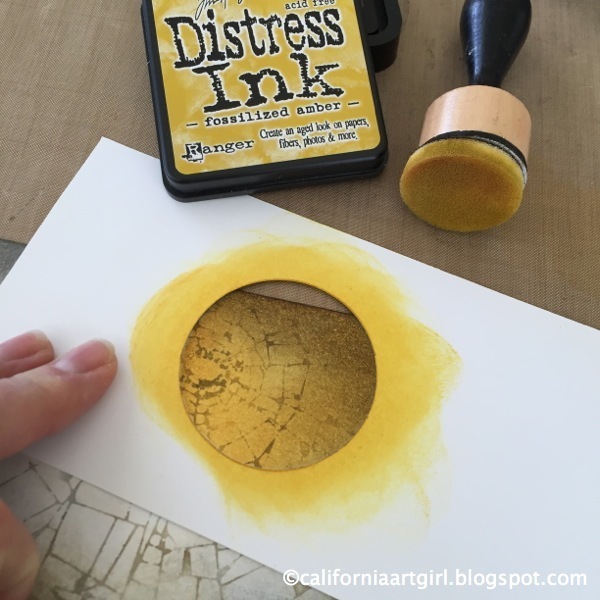 I'm so excited to be going back to The Scrapbook Island's Creative Escape in Los Gatos (San Jose area), California. 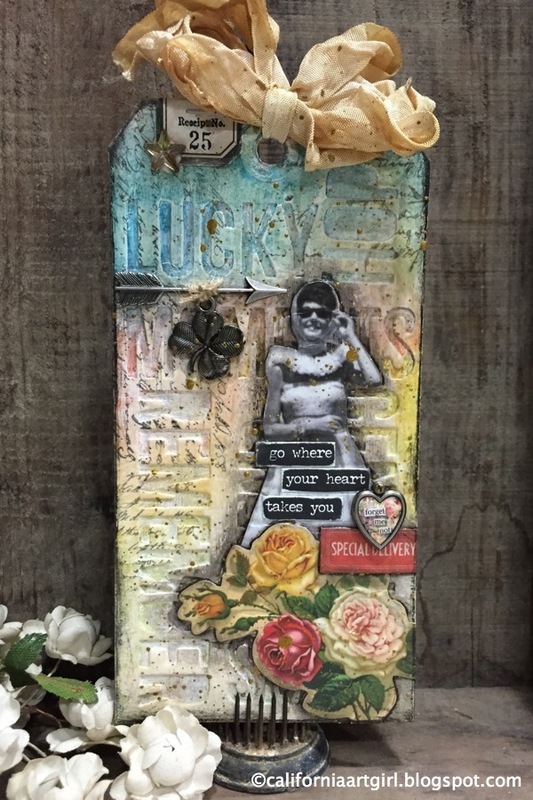 The store is packed with products to create with and vintage finds to add to your stash, the perfect combo of goodies. The classroom is huge and has big comfy chairs. It's a little piece of heaven! 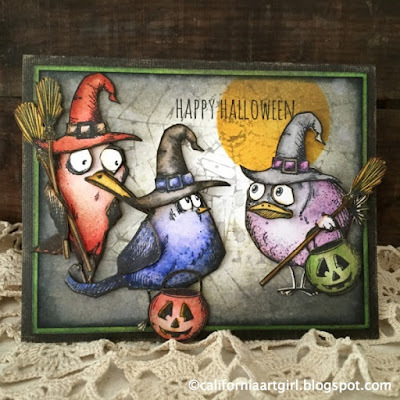 Are you “Bird Crazy”? Come learn coloring techniques using Distress Markers, water brush and the Distress Spritzer. 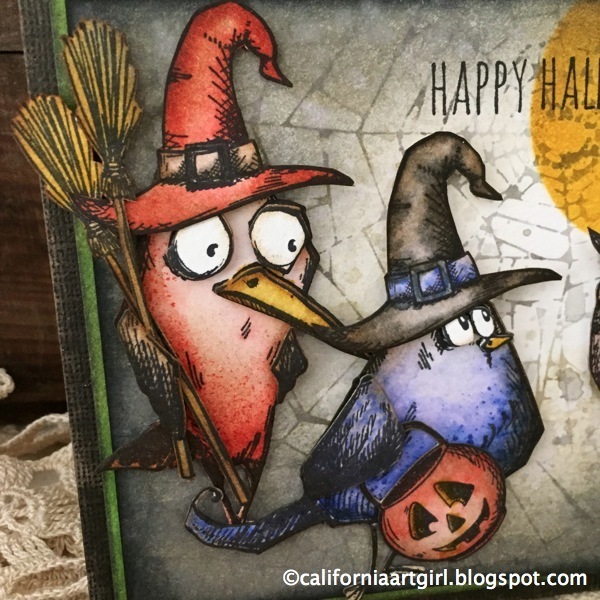 Each card will feature a background technique with Texture Paste, Distress Ink, stamps, Layering Stencils and more. 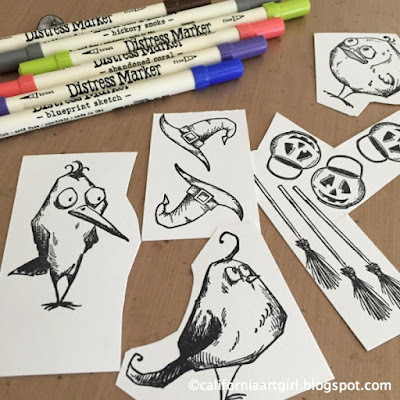 BONUS - Bird images are die cut for you! Saturday's class is already FULL. 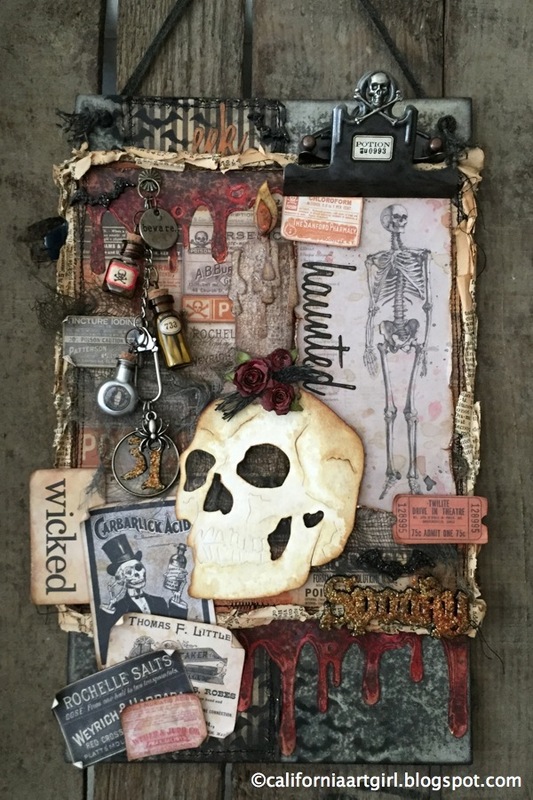 If you love Halloween as much as I do you will love this creepy decor piece because it’s all about the “Spook” factor with skulls, bones, drippy blood and tiny potions. Class is filled with techniques using many of the new and old Idea-ology, Sizzix and Ranger products to transform an ordinary worn cover in to a wall hanging that’s perfect for Halloween. Project photos coming soon after Tim's release announcement! The project is packed with the new Tim Holtz Idea-ology products! 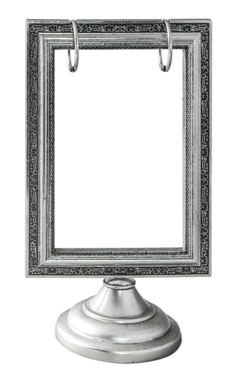 Create a nostalgic holiday shadow box by transforming an ornate metal Flip Frame in to a beautiful decor piece. 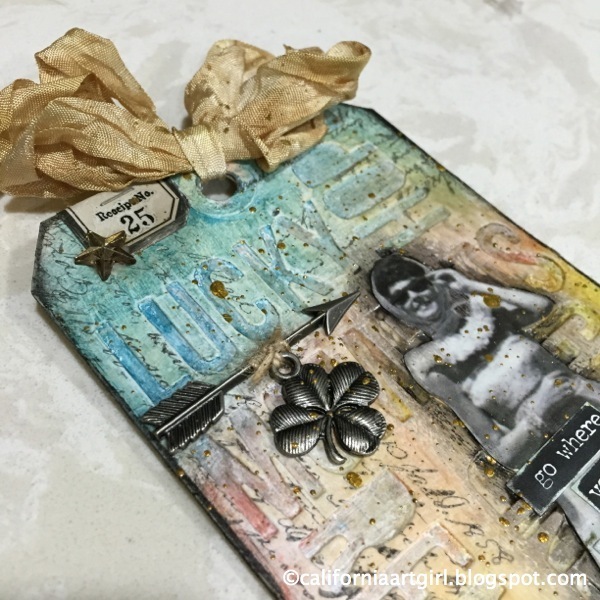 There is lots of techniques to share in the class using Distress Spray Stains, Alcohol Inks, Distress Glitter, Stickles Glitter and more. Make little pinecones and flowers using the Sizzix Tiny Tattered Floral dies, they will even have a little frosty sparkle on them. You will love the new Tim Holtz Christmas collection from Idea-ology that gives the project a old time vintage look. 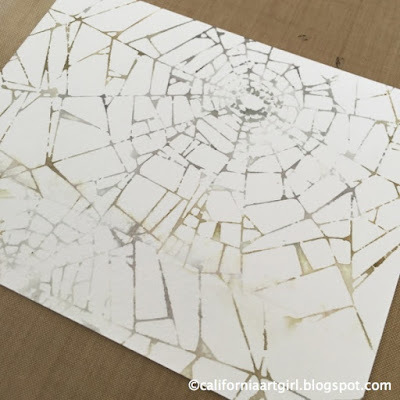 Join me to create this unforgettable keepsake to display for many years to come. This card features Mono Printing in the background for a spooky effect, masking on the moon using a circle die and coloring with Distress Markers, Waterbrush and the Distress Spritzer to add a little texture. 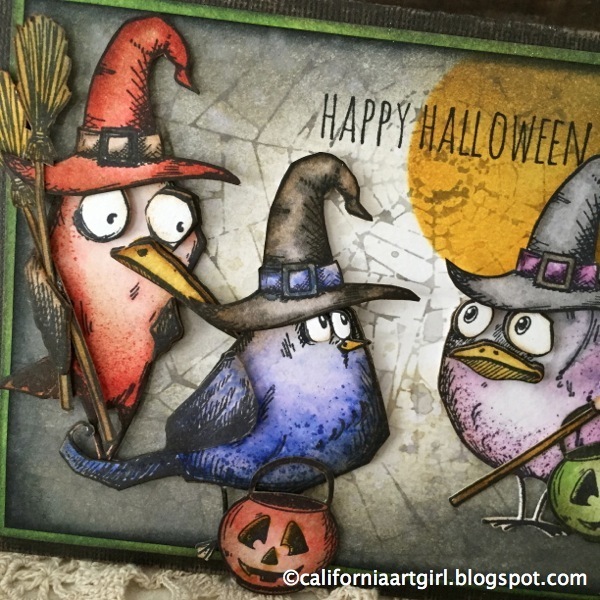 Stamp the Bird Crazy and Crazy Things images on to Watercolor Cardstock with Jet Black Archival ink. 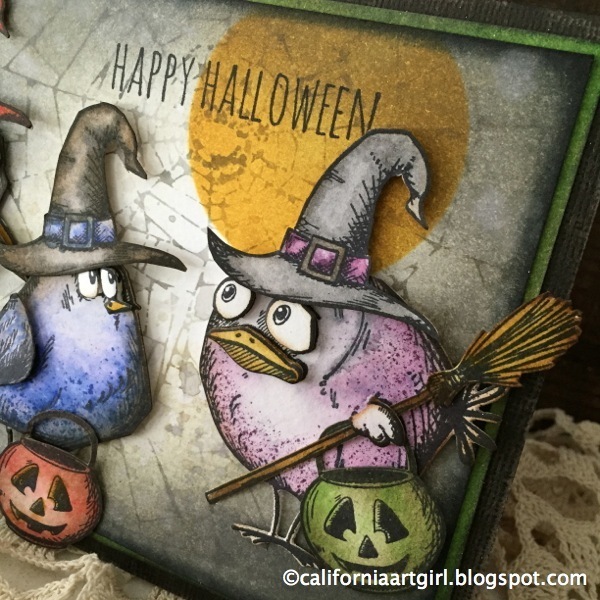 Color them with Distress Markers and then blend with the Detail Waterbrush. 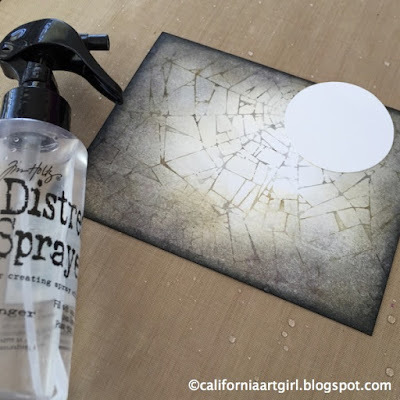 Add a little texture using the Distress Spritzer. You can see the full tutorial on coloring here. 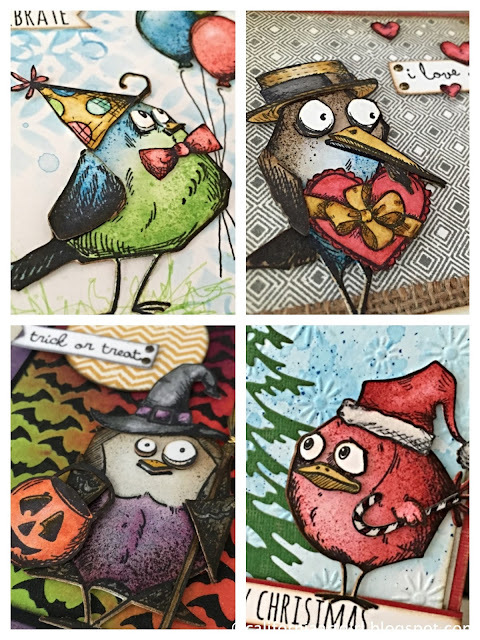 Don't forget Tim Holtz has a Bird Crazy Thinlits set that die cuts the bird, eyes, beak and wings. Makes it super easy. Coming in October is the dies for all the Crazy Things (accessories). I can't wait! Using the Shatter Layering Stencil from Stampers Anonymous apply Distress Ink directly to the stencil, spray with water, press on to a piece of Watercolor Cardstock, blot off excess water and ink, then carefully lift off the stencil. 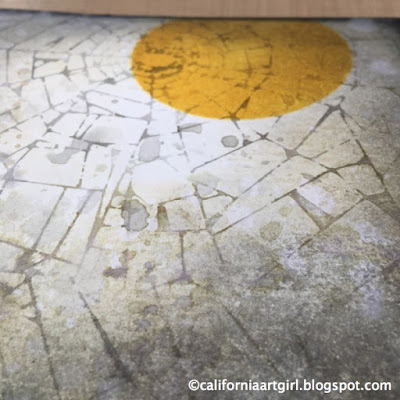 Repeat the mono printing technique for the bottom section. Add Distress Ink to the edges of the card with a Mini Ink Blending Tool and Distress Ink. Die cut a circle from a scrap piece of paper. I used the middle Sized Circles Movers and Shapers Die but any circle will do. 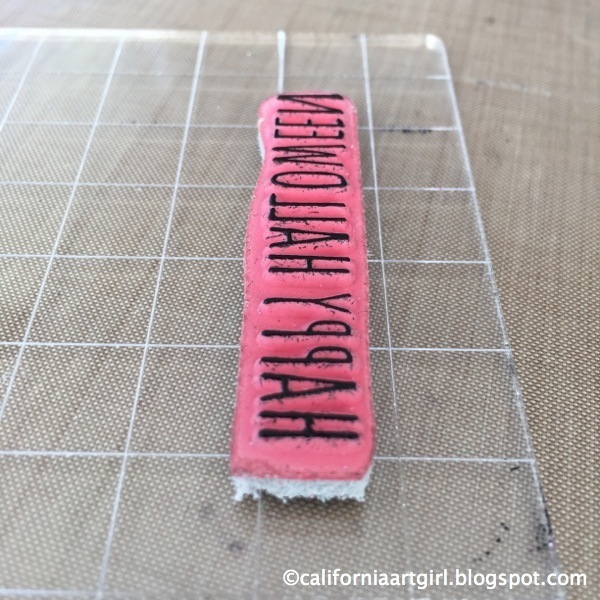 Save both the positive and negative from the die cut. Lay the circle over the background and use the Mini Ink Blending Tool to add Fossilized Amber for the Moon. 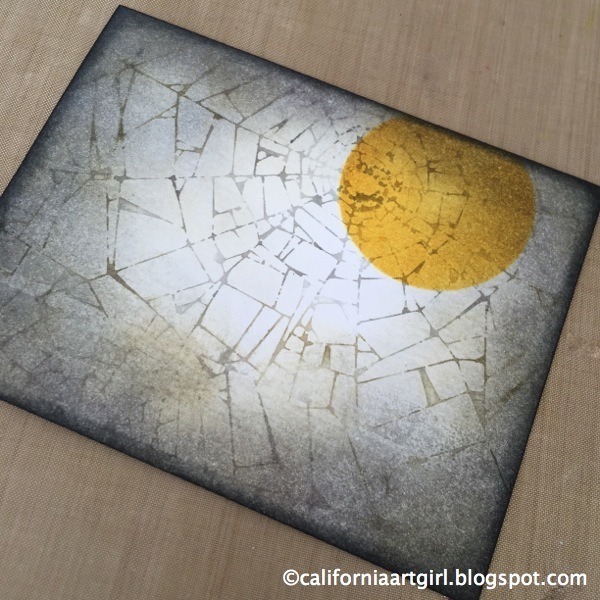 Fossilized Amber is the perfect color for the Moon! 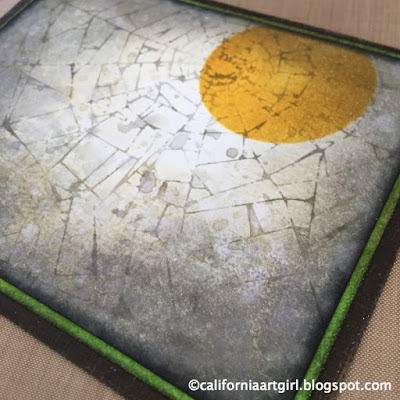 Place the Circle die cut over the moon to protect it from water spatter. 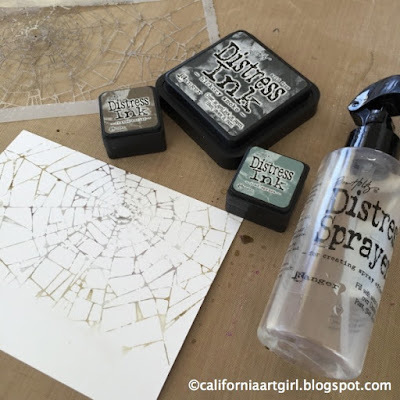 NOW with the new Distress Sprayer splatter a little water. If you just pull the trigger slowly it will create droplets of water. Super cool don't you think. Love this feature of the bottle no more putting water in your hand and flicking. Let the droplets sit for a little bit or use a Heat Tool to partially dry them the blot off the excess and it will create a lighter spot. It's all about the layers. I also added some droplets of ink. Don't forget to protect the moon on this step too. Often times I can't find the right color cardstock in my stash so this is a great solution Cut another piece of cardstock a little larger then my background. 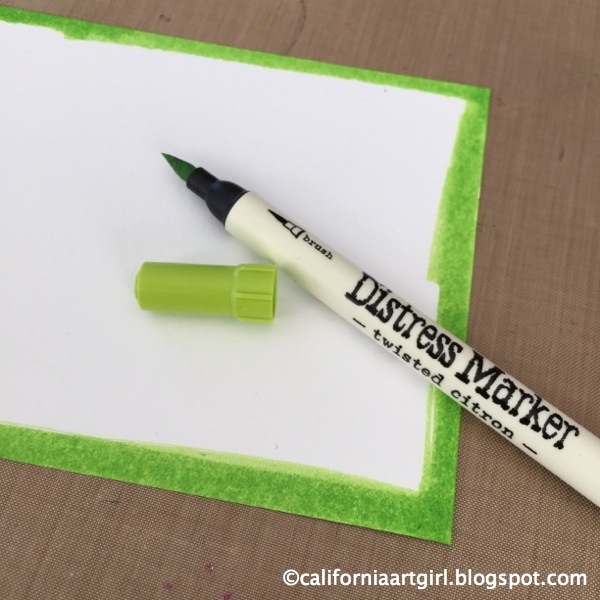 Color the edges of the cardstock with Distress Marker or Distress Ink. Now you have the prefect color that matches your card. 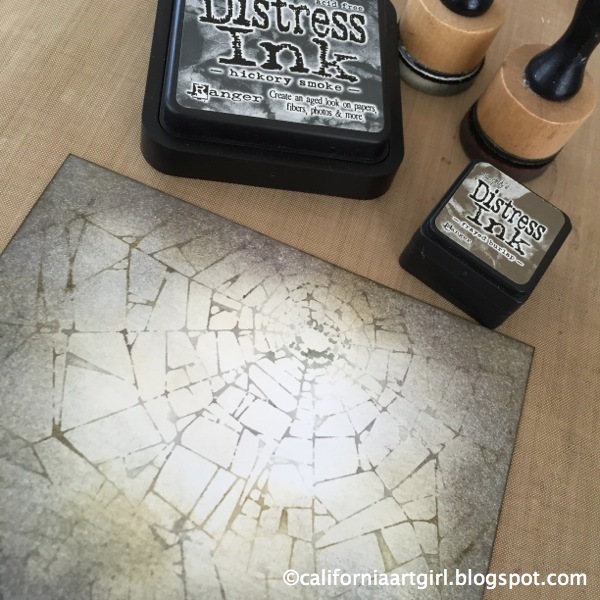 Ink all the edges with Black Soot Distress Ink on an Ink Blending Tool. Stamp the message from the Stampers Anonymous set Crazy Talk. This is a great set the has tons of Massages for the inside and the outside of your cards. Now you know how it's hard to get the message straight? With Tim's grid block it takes the guess work out of it. Mount the message on the block by lining up the grid with the bottom or top of the message. 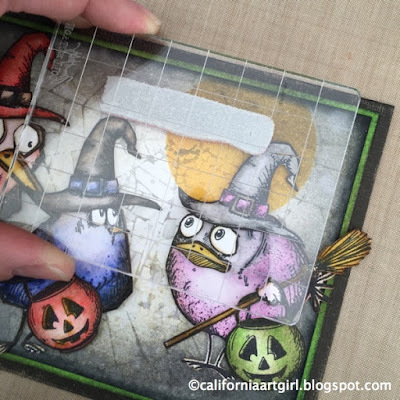 Then stamp the message on your card lining up the grid from the block. I like to test it on a scrap first. I love how easy these Grad Blocks are to use, so easy! Add the Bird Crazy Witches with foam tape. 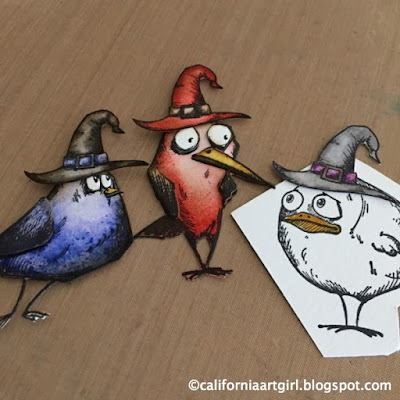 BEWARE: Bird Crazy can be very addictive! Thanks for popping in, I always love that you're here. Here's all the goodies I've used.